The day I gave birth to Adeline I knew very little about children with special needs. We were released from the hospital together. In my instructions from my doctor, she told me I was not allowed to drive or lift for two weeks. In Adeline’s instructions, I had to have her back at the hospital tomorrow. My husband had to be back at work, and with no immediate family around I had to disregard my doctor’s instructions to care for my baby. Adeline had severe jaundice and needed to have her blood tested every day at the hospital for a week. During this time I also needed to find a new pediatrician fast. A pediatrician that would respect my baby and give her the best care. I had previously been using a pediatrician with my other children, but I was shocked when I experienced my first negativity. She came to the hospital to see Adeline and told me “well, she is a mongoloid”. I felt like she socked me in the stomach. I saw my beautiful baby, and she just called her a “mongoloid”. She continued to tell us all the things Adeline would not do. Needless to say I knew I could never allow Adeline to be seen by her again. That day when I walked down the hall to the operating room to have a c-section, I had not idea what I was walking into. I had no idea how this new precious child would change and challenge me to a level of parenting I never knew existed. This child forced me into action. I quickly had to become a medical expert in down syndrome, a special education teacher, therapist and advocate. I am so grateful for Adeline’s life. It is filled with a purpose and destiny. Our family has learned so much from Adeline. We will never be the same. 1. To rejoice in the small things. We were so excited when Adeline learned how to put things “in and out”. 2. Flexibility – I never thought I would allow my children to watch Barney while eating dinner, but Adeline does. She eats and is not aware of what she is putting in her mouth, it works. 4. The value of uniqueness – My children have learned that we all have areas that are weak and strong, and it is O.K. 5. Thinking out of the box. Therapy equipment and services are expensive. I have learned how to make something myself or find an alternative. 6. I have learned how to accept help from others or ask for it. 7. How to be research my child’s diagnosis. In the special needs world there are many opinions and methods about what will help your child. I have had to research these and decide what is best for Adeline. 8. Boldness – No one will speak for Adeline but us, and we must do it. 9. I have learned how to trust my “mother instincts” more than ever. 10. Words and slang can be hurtful. Many words such as mongoloid, retarded, are used without thinking. I never what Adeline to hear someone use one of these words referring to her or anyone else. Adeline has changed our family from the inside out. 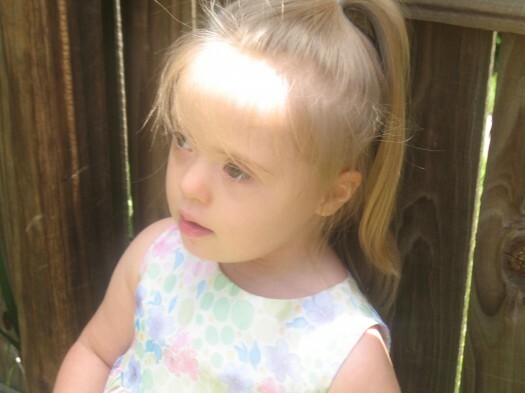 If you would tell me now that I was having a child with down syndrome; I would RUN down that hall to get her. Sandra Casson is the mother of four amazing children ranging in age from 13-3. She holds a degree in Elementary Education and taught in various classrooms in Chicago. Currently she is the creator and writer of the blog We Can Do All Things, where she writes about teaching her youngest daughter Adeline. You can find her at her blog We Can Do All Things along with her Facebook page . This is beautiful. I have a daughter with special needs too. She was a premie and I thought she was the most beautiful baby in the world. The nurse jokenly said, “She looks like ET.” Huh? But she did have a large head, very large blue eyes and a tuff of fluff on top of her head. To this day, I still think she is very beautiful. She has brought me so much joy and teaches me everyday about numbers 1-10 above. Adeline is very beautiful – gorgeous eyes, long eyelashes, sweet smile. She’s an angel full of joy, living her life, sharing her love. And Sandra is a great mom. Susan that comment the nurse said was terrible 🙁 I am so sorry she said that! I am SURE she is beautiful, then and now inside and out.